^ NOTE: On the Audio Commentary with Historical Figures during Scene 17 (c 1:12) of the Thirteen Days DVD, the commentator states that President Eisenhower ran the U.S. government outside of Washington for four days in 1956. ^ Tom Vanderbilt. "Is this Bush's secret bunker?". The Guardian, August　28, 2006. ^ Gellman, Barton and Schmidt, Susan. "Shadow Government Is at Work in Secret". Washington Post, March 1, 2002. 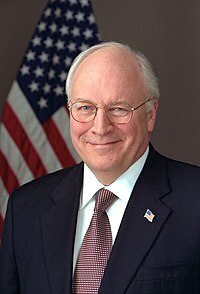 ^ David T. Payne,"Time for Cheney to go", Enter Stage Right, July 12, 2004.